WMS Log Storage is a feature rich Media Services log analyzer. The program generates HTML-based reports with tables and charts. Highly detailed and easily configurable reports output to screen, file directories, ftp or e-mail. Unlike other analyzers, WMS Log Storage has been designed especially for analyzing Windows Media Services or Adobe Flash Media Server log files and supports the entire set of Windows Media Services log file data and provides the best and most complete analysis of these files. WMS Log Storage supports log files of the W3C Windows Media Services format and exported files in the CSV format. Needless to say, it can recognize log file formats automatically, extract compressed log files, process multiple log files and download log files from various sources: local path, Web, FTP or Database via ODBC. The flexible system of filters allows you to customize in the best possible way so that only data that you need is displayed in reports. WMS Log Storage will give you information about your site's visitors, activity statistics, file access statistics, information about referring pages, visitor country, referring sites and more. The program has a user-friendly interface so you can start working with it right after you install it spending much time on configuring it. Statistical data is displayed in diagrams and tables. It is also possible to print reports. 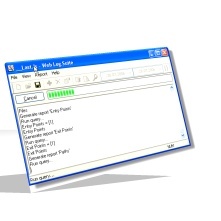 The WMS Log Storage supports more than 10 log file formats. It was tested with all popular web servers, media services, proxy servers, firewalls etc. Needless to say, it can recognize log file formats automatically, extract compressed log files, process multiple log files and download logs from various sources: Local or Network path, Web, FTP or databases via ODBC. WMS Log Storage can even read most popular compressed log files: BZIP2, GZIP, ZIP, 7z, rar ans other so you won't need to unpack them manually. You're welcome to submit any questions, suggestions and comments about WMS Log Storage! Please let us know what you would like to see in the future versions here please.